Staged construction modelling is essential for many forms of bridge design and construction, whether it be for carrying out a detailed analysis of an incrementally launched segmentally constructed box girder bridge, modelling cable or hanger replacements for cable stayed and suspension bridges, or modelling a demolition process. LUSAS provides you with the means to model the construction, rebuilding or demolition of your structure over time, and evaluate the effects of structural changes, load applications, and any time-dependent material changes. A complete staged construction modelling process for a model is controlled in the Analyses panel of the LUSAS Treeview. 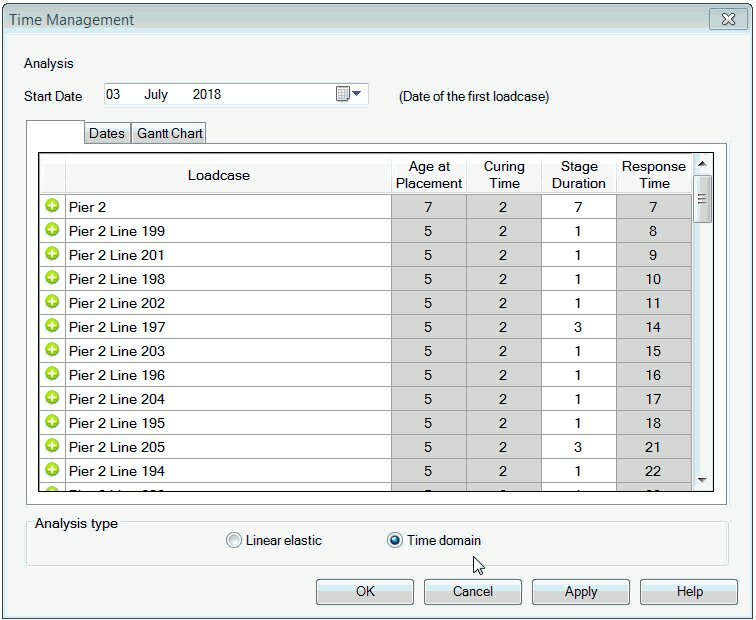 When modelling, groups of elements and associated attributes can be activated and deactivated, with supports being carried forward between loadcases, introduced or removed to accurately represent each stage of construction. Construction history tables containing displacement history and incremental displacement results can be produced. 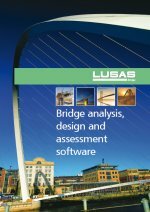 With LUSAS Bridge, unlike some software, only one model file need be created and this can contain all of the information required to carry out an analysis of every stage of construction. The effects of geometric and material nonlinearity, and time-dependent material effects such as creep and shrinkage can all be included. 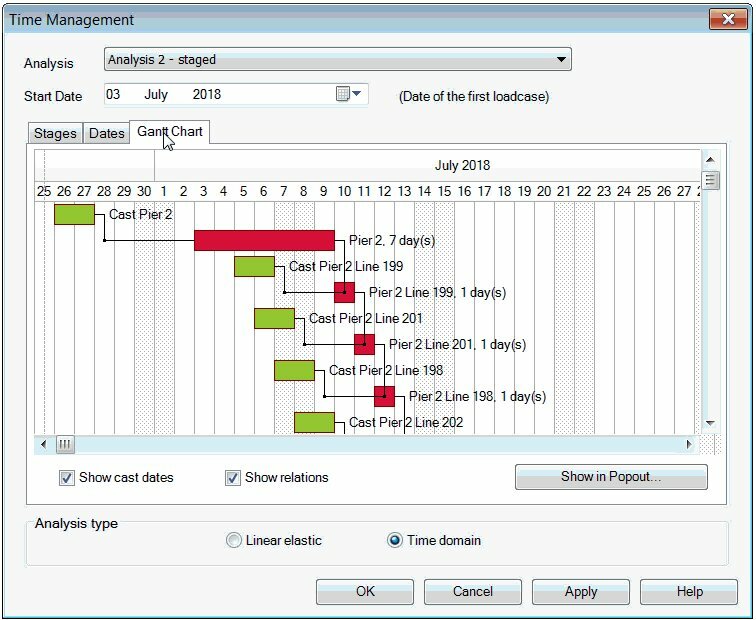 A time management facility provides the means to manage a simple construction schedule and easily adjust the duration of pre-defined construction stages in a staged construction analysis. It can be used to easily and automatically update the total response time values in nonlinear and transient controls that have been previously specified for each loadcase of a staged construction analysis. Use single or multi-tendon wizards to define and assign tendon properties and time-stages to features of a model. Incremental effects can also be specified allowing you to view and assess the net changes to the structure since the previous stage. 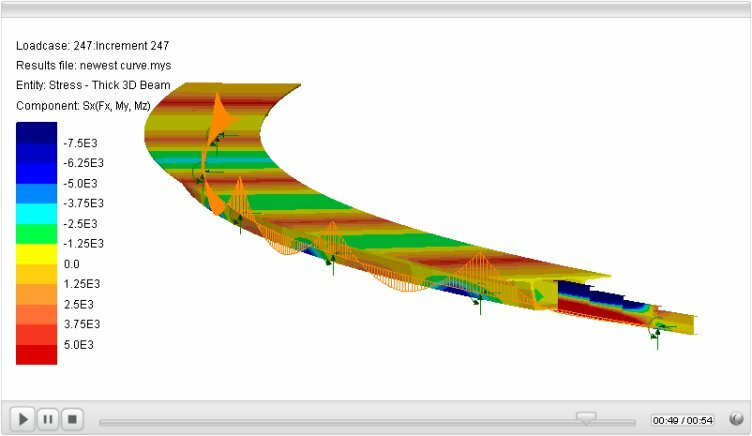 Animation of axial forces in members during dismantling of the San Francisco-Oakland Bay Bridge East Main Span. 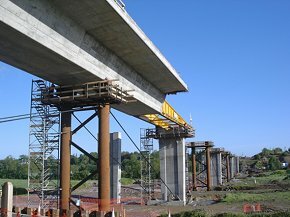 The erection of all segments for a span in a set, which is then aligned, jointed, and ultimately, usually, longitudinally post-tensioned together to make a complete span. In LUSAS, this can be modelled as a line beam model with optional fleshing of the deck cross-section to show results contours. The animation below shows the construction sequence for the twin rib span-by-span example shown (substructure not included). The analysis can incorporate post-tensioning between stages, and creep effects as construction continues, as required. The building of a bridge superstructure from both sides of a pier in a scales-like fashion. Using LUSAS, creep / shrinkage analysis can incorporate an age attribute (for precast elements) and checks on robustness can also be made as, for example, where a segment may be inadvertantly dropped by crane and where dynamic effects (impulse) are important. 2nd order (P-delta) effects could also be included. Incremental launching involves the casting of a continous chain of bridge segments on-site adjacent to the actual location of the bridge and then pushing the growing superstructure out over temporary and permanent supports at the bridge's location - as used in the construction of the Blackwater Viaduct in the Republic of Ireland. Using LUSAS, incremental launching can be carried out for both in-line deck launching, or for a curved deck launch. Modelling of incremental launching can be done by activating and moving a series of supports backwards under a model that is incrementally being added to. This can be done via general modelling facilities, or by scripting methods to automate the modelling process. An example of this method for a box girder bridge with a simplified nose is shown below. Click to play movie (in new window). The initial proposed I95 Mississippi River Bridge was designed to be a record-breaking, cable-stayed structure linking the States of Illinois and Missouri in the USA, helping to relieve traffic on existing bridges across the river. Designed by Modjeski & Masters for its clients Missouri and Illinois Departments of Transportation, staged construction facilities in LUSAS Bridge were used to model an 800 day construction period, followed by a 10000 day period to allow for creep over that length of time. Any modelling and analysis capabilities described on this page are dependent upon the LUSAS software product and version in use. Last modified: April 04, 2019.